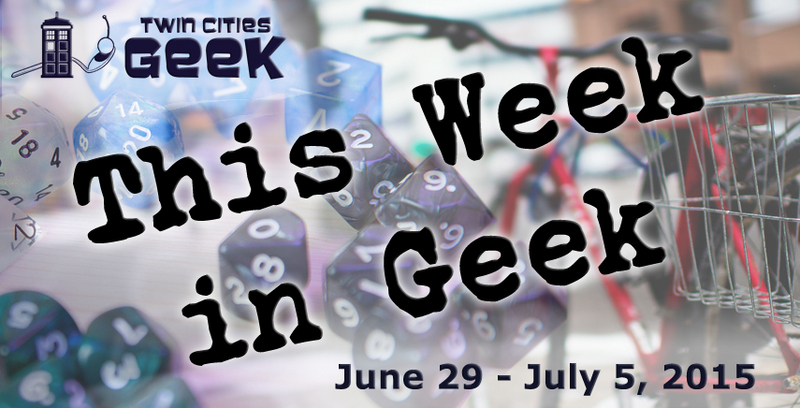 Welcome to This Week in Geek, your guide to events of interest to the Minnesota geek community for the week of Monday, June 29th through Sunday, July 5th. When: Monday, June 29th at 7:30 p.m.; Wednesday, July 1st at 8:30 p.m.; and Thursday, July 2nd at 8:00 p.m. This free concert series visits Minneapolis on Monday, Plymouth on Wednesday, and Winona on Thursday. (It will also be in Hudson, Wisconsin, on Monday of next week.) Come hear some crowd favorites performed by the Minnesota Orchestra, including selections from Star Wars: The Phantom Menace and the always-awesome 1812 Overture. When: Monday, June 29th at 6:00 p.m. The Beer + Comics book club will be discussing two collections of comic books by Noelle Stevenson at its meeting tonight: Lumberjanes volume one and Nimona. While this book club formerly met at Wild Rumpus Books for Young Readers, they are now “officially taking the show on the road” and will “be trying out a few different venues to see what fits us best.” Tonight, the venue is moto-i. But while the club’s location may have changed, its members’ desire to discuss beer and comics with fellow fans of both has not! When: Tuesday, June 30th at 7:00 p.m.
CONvergence is an annual four-day convention for “fans of science fiction and fantasy in all media”—the “premiere event of our kind in the upper mid-west.” Each year, CONvergence has a different theme, and the theme of this year’s convention is DoublePlusGood, which “celebrates dystopian visions in science fiction and fantasy.” Special guests include writer and voice actor Nicole Dubuc, puppet mastermind Gordon Smuder (whose project Vermin was featured on Twin Cities Geek in April), screenwriter Charlotte Fullerton, and more. Years ago, when I was considering attending CONvergence for the first time, a friend advised me that–like the Matrix–“No one can be told what CONvergence is; you have to see it for yourself.” If you would like to learn more about the convention before committing to it, though, visit the What is CONvergence? page of their website. If you are already attending but haven’t had an opportunity to plan your weekend yet (possibly because you’ve been too busy creating the costumes that you will be wearing), the full listing of panels and other programming can be found on the Schedule page of their website. I, and many of us at Twin Cities Geek, hope to see you there! When: Thursday, July 2nd at 7:00 p.m.
Another group of the Geek Partnership Society, the Crafty Geek club (and its sub-club Make It Sew), meets Thursday evenings and invites you to “bring your crafty stuff to do” or to “hang out and work with the crafty stuff we have here!” This week, Crafty Geek will not be meeting at the Waterbury Center as usual, however; it will be at CONvergence! When: Saturday, July 4th 10:00 a.m.–4:00 p.m.
History geeks who aren’t busy at CONvergence can head to Fort Snelling on the 4th to “Celebrate our nation’s independence with activities that showcase what life was like in the early 1800s.” Activities and entertainment include cannon salutes, a mock battle, historic games, and more.